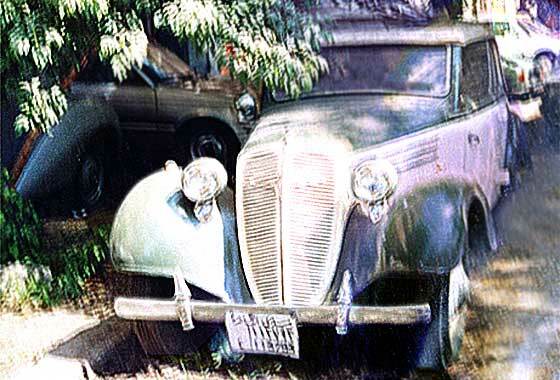 Fascinating photo found on the AACA website posted by West Peterson (USA) asking for identification. We were lucky to find web pictures and contact previous owner who confirmed it was one-off cca 1897 Goddeu Tandem. Goddeu was also the inventor of the paper staple. 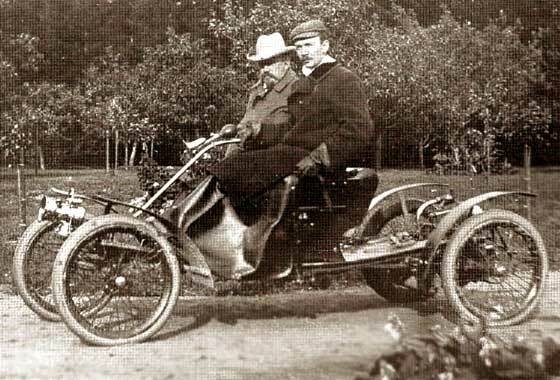 The Tandem has a rear boxer twin and two clutch/gear transmission, being his patent test bed for his automotive ideas and was used to assure his investors his ideas would work. Un-restored, and maintained all it's life. Alan Baker (UK) sent this photo to the Automobile magazine requesting identification. The photo shows a neighbour's Grandparents in approx 1902. -- We are relatively sure that this is cca 1900 Clement Panhard design. The bodywork is Dos-à-dos. In view of this, and as it was photographed in Glasgow, it could also well be a "Stirling 5HP Light Dogcart". Clement Panhard cars were distributed in the UK by Stirlings of Edinburgh, called Stirling Panhard, Clement Stirling or just Stirling. One of a number of very interesting photos submitted by Cartom Weaving showing vehicles in the 20s and 30s Scandinavia, for which he is seeking identification and dating. -- This one shows a very unusual cca 1903 Waltham Orient Buckboard made by a company formed in 1897 for manufacture of the Orient bicycle. Basic, it has no springing, relying on planks of wood forming the floor to provide the flexing. Single cylinder, rear mounted 4hp petrol engine directly coupled to axle. Unusual photo received from Sylvia Murphy (Australia). Location is Bombay, India and the driver is a Harry Soundy, born 1863 & died 1922. With him are his sister Kate, in back, step mother and sister Elsie. As Elsie married in September 1906 and Harry married in 1907, the photo was probably taken before then. Harry was a photographer and ran a major studio in Bombay. It is likely that he had the picture coloured. 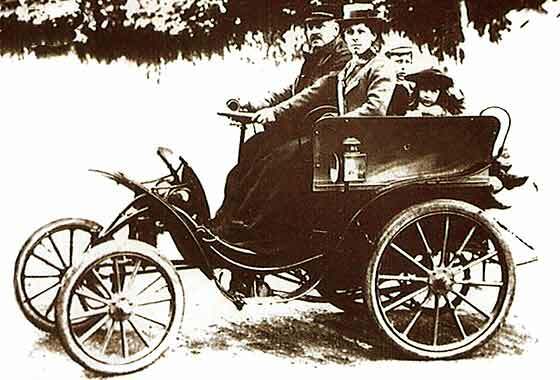 --The car is a cca 1905 Humber 8/10 Tonneau. This rad. for one year only. 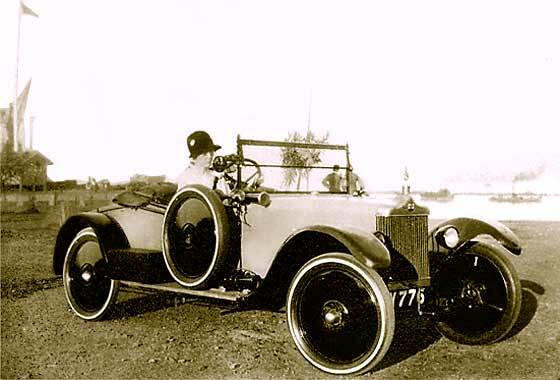 Fascinating rare photos received from Laurie Kathage, of Brisbane (Australia) advising that he owns a 1911 Cotton Tourer. 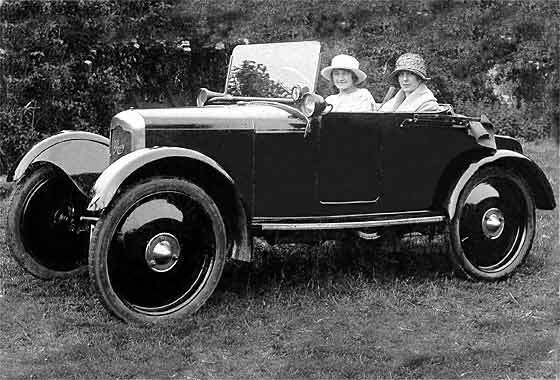 Only about 15 of these cars were made, by Rennie & Prosser in Glasgow, Scotland on behalf of Cotton Motor Car Co, Brisbane. Designed by an Australian landowner Alfred Cotton who needed a vehicle to cross very inhospitable terrains. The car had high ground clearance and a patented engine driven forward winch. Engine was White & Poppe 12/25HP OHV. Interesting photo received from Gabor Radocz & Andreas Born (Hungary?) asking for our help in the identification of the car in the photo. The photo was taken in a European country now called Slovenia, near the city of Tržic (Loiblpass). Alpine car races were held here from the early 1900's, and are still being held today. The picture was perhaps taken around the 1910's. 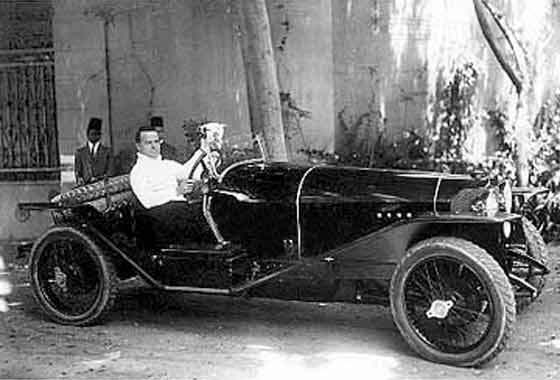 -- The image is too small to identify positively as little detail available but we think a cca1911 Lancia Delta or Epsilon. 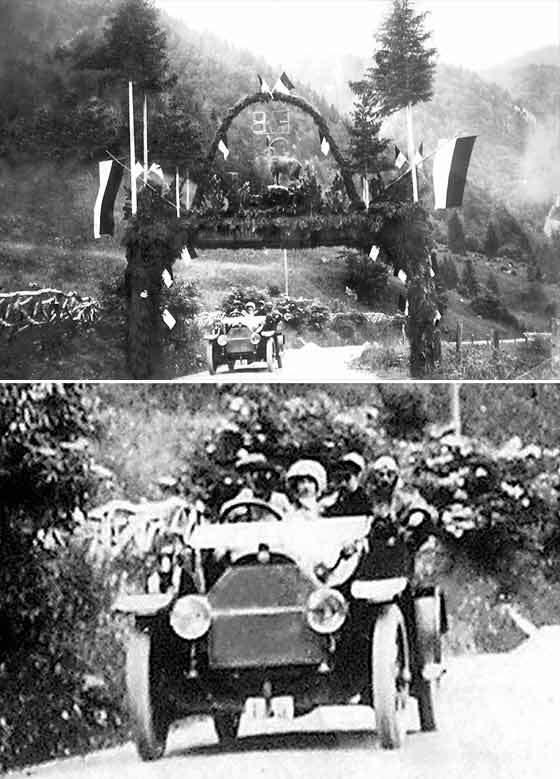 Cinema screen grab received from Mark Dawber (New Zealand) of a car which appeared in a '28 film called 'Show People' and being investigated on IMCDB. -- Photo deserves more than just a passing glance as it is fitted with a very unusual device called the Eveready Automatic Engine Starter. Friends at the AACA advise unit has a self re-winding after start heavy-duty spring, released by a pedal. This was an after market accessory. 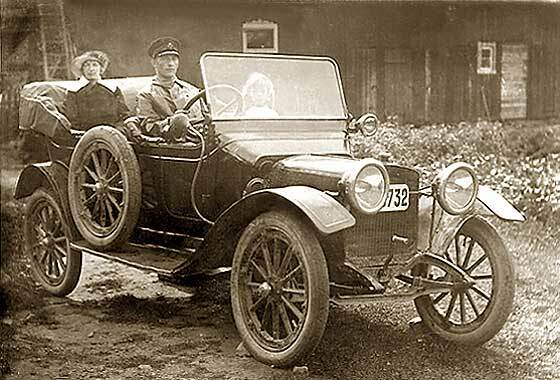 The car is a cca 1912 Stearns-Knight Five Passenger Tourer. One of a number of very interesting photos submitted by Cartom Weaving showing vehicles in the 20s and 30s Scandinavia, for which he is seeking identification and dating. 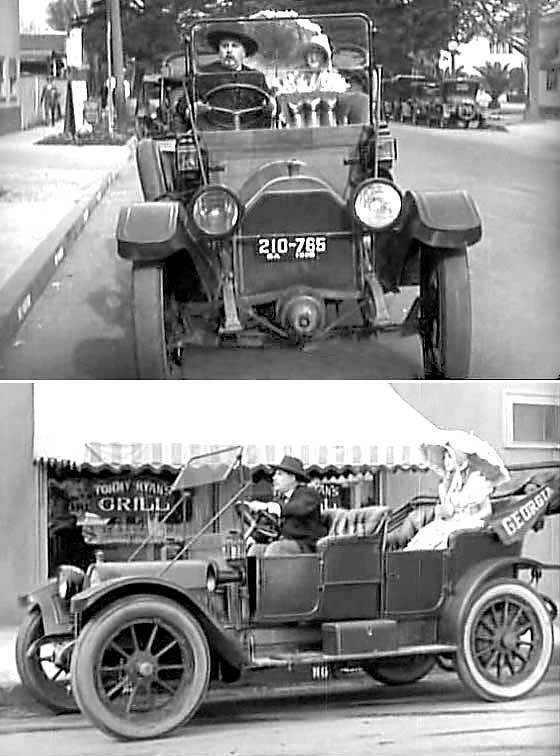 -- This one shows a cca 1913 RCH, a car made by Hupp after he walked out of Huppmobile and after they took him to court for continued use of his own name. 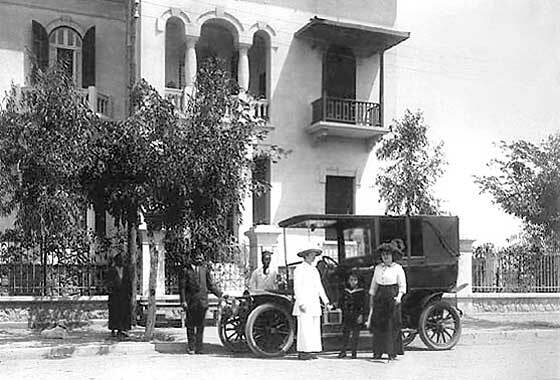 RCH Corporation was an initial success with many thousands of cars sold and/or ordered, but the company was undercapitalised and had closed down by 1915. Another photo received from Mahmoud Ezzeldin (Egypt) requesting identification. Unfortunately the photo is far too small. It is not normally possible to accurately identify early cars by their bodywork. Bodies are by external coachwork companies. Fashions would make bodies look similar. Same bodies could have been fitted on a number of different makes of cars. We need big resolution photo scans especially showing radiator and the bonnet. Possibly a 1907/8 FIAT Landaulette. Request received from Mark Dawber (New Zealand) to have a go at identifying a photo on OldClassicCar site. Photo had been submitted by Ann requesting identification. - We are relatively sure this is a cca 1914 NAG Landaulette. Neue Automobil Geselleschaft was a German company from Berlin, part of AEG who also made commerical vehicles. This car may have been a Taxi. The picture may have been taken a few years after manufacture as unlikely to be a German import post WW1. Photo received from James Walker (UK) showing two unidentified women sitting in an unidentified car. Grandmother went to New York [using Assisted Passage] in the 1905 to 1912 period, and married in Toronto, Canada, before returning to the north coast of Wales where his half-aunty was born in 1913. -- Granny's return to Wales was about 10 years before the car was made. 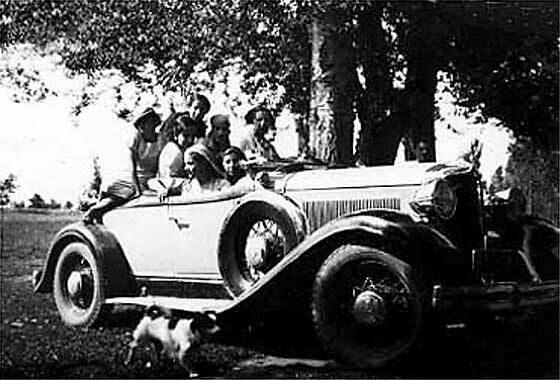 The car is a British cca 1922 Rover Eight Two Seater. About 17,000 made 1919 and 1925. British tax disc. Lovely evocative photo received from Erich Bruckner (USA). His mother thinks the photo was taken about 1922. His great grandfather was working on a construction project called the Hetch Hetchy Project, building a power plant in Moccasin California to supply power to San Francisco. The project started in 1921. One of his grandmother's friends had this car and was the only young person around who had a car. This is a relatively unusual cca 1922 Jewett Touring, follow-on of the Paige. One of two new photos received from David Hillman (Switzerland) after we identified the Ariel car for him. There is no background to this picture but we have been asked to provide our expertise in identifying the vehicle shown. -- The rounded peaked radiator but with flat bonnet is the giveaway. 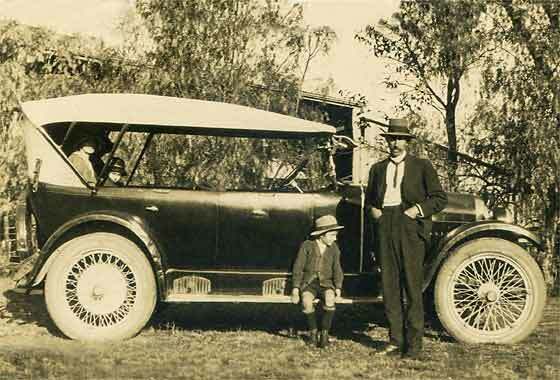 The car is cca 1923 Standard SLO Two Seat Tourer. The dating is helped on this one with the radiator matrix going round the sides. Unusual disc wheels and low windscreen. Bodywork 'town' names. One of three photos received from Scott Fagg of Bayside Vehicle Restorers Club, Brisbane (Australia) passed to him by a friend who helps a local historical society date photos based on fashions and cars. These photos have them stumped. They believe the photos were taken in Australia, so could be Australian built bodies on foreign running gear. 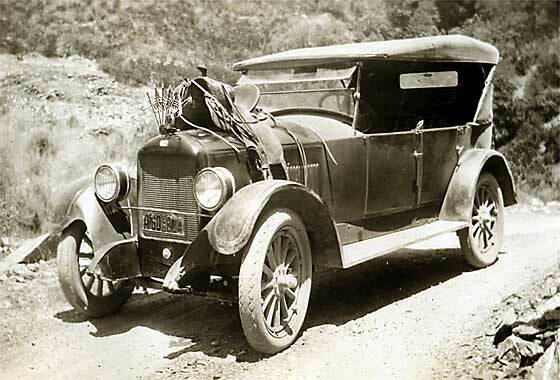 -- With the assistance of our friends at the AACA we are relatively sure this is a cca 1923 Studebaker Light 6. Interesting wooded background. Two more small photos received from Mahmoud Ezzeldin (Egypt) asking for identification. Both photos show Prince Abass Halim of the Egyptian royal family, grandson of Prince Mohamed Abdel-Halim and son of Mohamed Ali, the founder of the dynasty. Seems he was a bit of a maverick having organised workers unions and strikes, being stripped of his royal titles and fighting for Turkish and German armies in WW1. 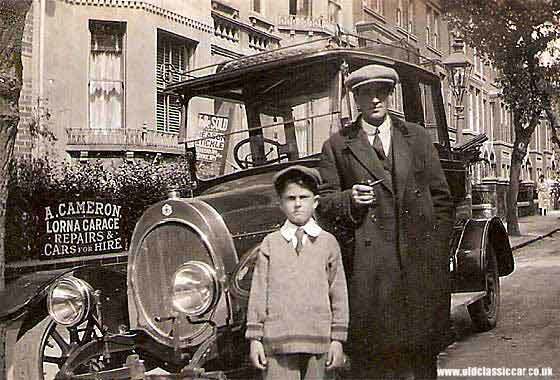 The car in this photo appears to be a 1923/24 Mercedes 1.5L Sports. One of a number of very interesting photos submitted by Cartom Weaving showing vehicles in the 20s and 30s Scandinavia, for which he is seeking identification and dating. -- This one has a very striking car with two military gentlemen in it. 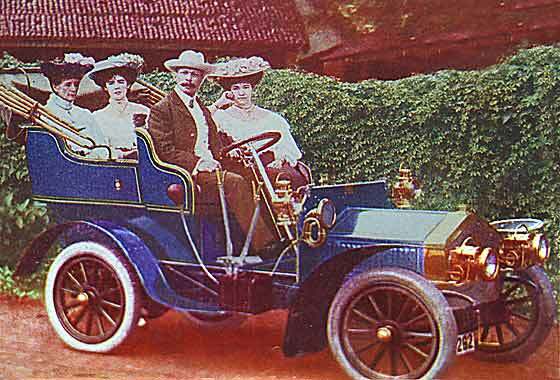 The car features the very fashionable 'spitzkuhler' pointed radiator much then in favour with German Austrian and Italian car manufacturers. 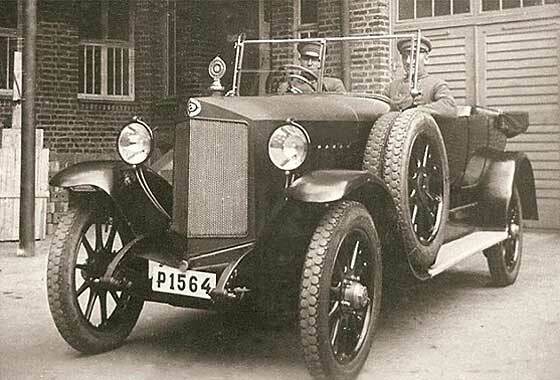 This is in fact an Austrian 1924 Steyr Type 5 Tourer. Became Stayer-Daimler-Puch. Makes war tanks today ! 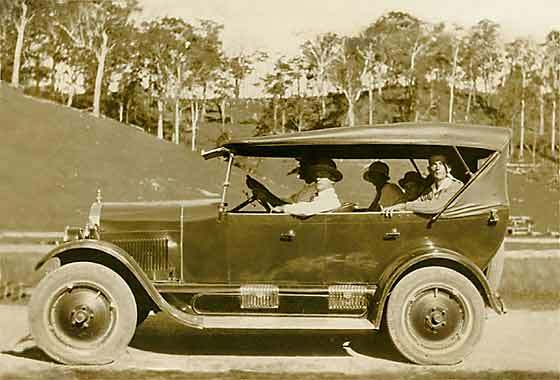 One of three photos received from Scott Fagg of Bayside Vehicle Restorers Club, Brisbane (Australia) passed to him by a friend who helps a local historical society date photos based on fashions and cars. These photos have them stumped. -- We are not sure on this one. Accessory Hayes wire wheels with 5 lugs so possibly a very unusual Earl (1922-23 revamped Briscoe) or more probably a cca 1923 Nash Touring. 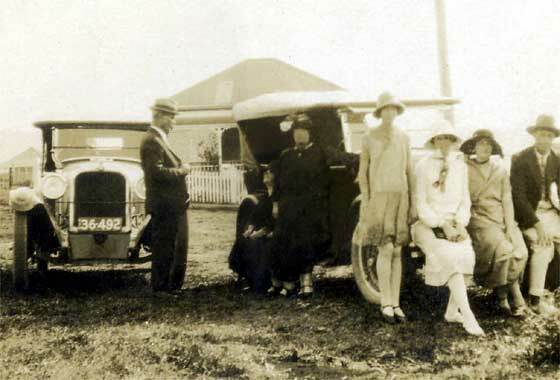 One of three photos received from Scott Fagg of Bayside Vehicle Restorers Club, Brisbane (Australia) passed to him by a friend who helps a local historical society date photos based on fashions and cars. These photos have them stumped. They believe the photos were taken in Australia, so could be Australian built bodies on foreign running gear. -- With the assistance of our friends at the AACA we think this one is probably a 1924-5 Dodge Brothers Touring as it has the bulkhead lights. One of two new photos received from David Hillman (Switzerland) after we identified the Ariel car for him. Seems we are the talk of the village ! There is no background to this picture but we have been asked to provide our expertise in identifying the vehicle shown. 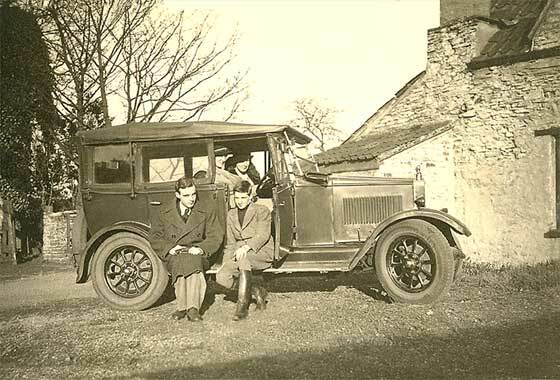 -- We thought it could be a Morris Empire or a Swift and our Chas Moody confirmed that this one is a cca 1927 Morris Oxford Tourer (Sept 1927 to August 1928; five stud wheels, swaged mudguards, dished spoke steering wheel). 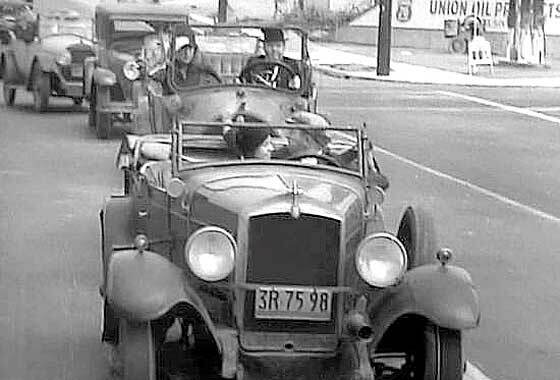 Another cinema screen grab received from Mark Dawber (New Zealand), this one of a car which appeared in a film called '“If I Had a Million” starring WC Fields. -- Assistance provided by the AACA, which needed peripheral thinking. The car must have done a number of 'takes', as it had a bash in the back. It is a cca 1928 Durant DeLuxe Sport Roadster but without all the chrome embellishments over the radiator matrix. This must have broken and had been fully removed. Another small photo received from Mahmoud Ezzeldin (Egypt) for identification. Photo shows the famous Syrian/Egyptian Singer/Actress "Asmahan”. Asmahan and one of her friends were later killed in an auto accident in 1944. The car had gone out of control and drove into the Nile. It was suspected that the accident was the work of the "British Intelligence" or "German Gestapo"; there were rumors about her association with both! - The car is a c1931 Chrysler CM6 Sport Roadster. One of a number of very interesting photos submitted by Cartom Weaving showing vehicles in the 20s and 30s Scandinavia, for which he is seeking identification and dating. -- This one has the rider in clothes and pose very reminiscent of Marlon Brando in the Wild Ones. Interestingly, Brando had a British motorcycle in the film, a Triumph twin. 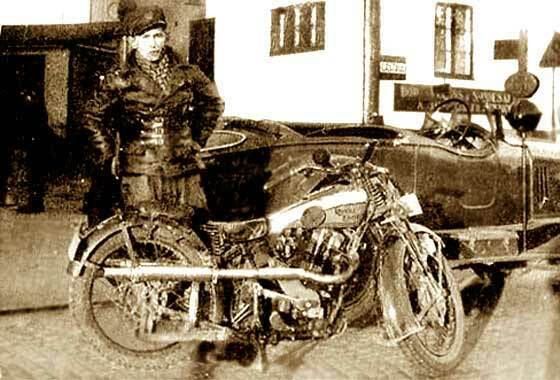 This chap also has a British bike, a cca 1936 Royal Enfield Model L 500cc. The car in background is a rather racy French cca 1924 Voisin C5. 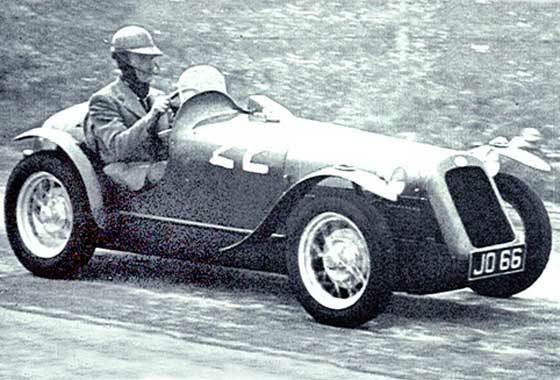 Enquiry received from Gianfranco Carbini from (Italy) saying he is considering purchasing an 'Austin Barchetta Seven Tourer special 1953' but does not have a picture of it. Could we help? -- Our Austin Seven racer John Caddy found a reference in a 1958 book "Austin 7 specials" by Bill Williams of 'Cambridge Engineering' which shows two different photographs of Cambridge Specials. Barchetta' translates to a 'roadster', 'tourer' suggests a 'convertible' with a roof and windscreen. Saga on the Gianfranco Carbini from (Italy) continues with a very blurry photo of the car he is considering purchasing. He called it a Cambridge but from the photos, our Austin Seven racer John Caddy and others from the 750 Club think the car strongly resembles a Hamblin Cadet body. These were manufactured in Sherborne in Dorset and marketed in London at Super Accessories who commissioned or were sole agents for the Cambridge. The Cadet body was an early exercise in glass fibre. A rather fuzzy and shaken photo received from Mahmoud Ezzeldin (Egypt) saying he has been organising classic car events in Egypt for the past 5 years www.classicpassions.com. He is having trouble identifying this car and kindly asks our help. "Thank you for creating such an amazing website. Will surely be sending a lot more in the future. "- Thanks for your kind words. We have had a go at repairing the photo and can advise that this is a German cca 1939 Adler Trumpf 2 Lt.